We all have an angel sitting on one shoulder and a devil on the other, the devil entices you into playing along with the naughtier elements in life, those that you might be a little more hesitant to venture towards. Embrace it, we all need to let loose and explore our naughty side every now and then. Microgaming allows you to do just this with the introduction of one of their hottest games - Red Hot Devil slot machine, a 5 reel 25 pay line video slot. It is inevitable that the devil will tempt you into entering his fiery abode otherwise known as hell, where things are expected to get hot, hot, hot! 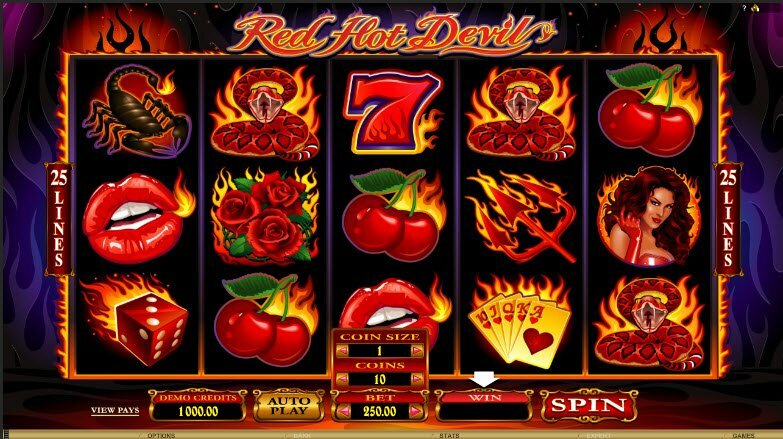 The Red Hot Devil slot fiery red head is almost hypnotising in her ways, she will lure you in along with the other flaming symbols including the devils fork, sultry lips, deadly snakes, scorpions, red roses, flaming cards and blazing scatter symbols. Dont expect too much animation in this slot though. Landing 3, 4 or 5 scatters symbols in any spot on any reel triggers the bonus round. 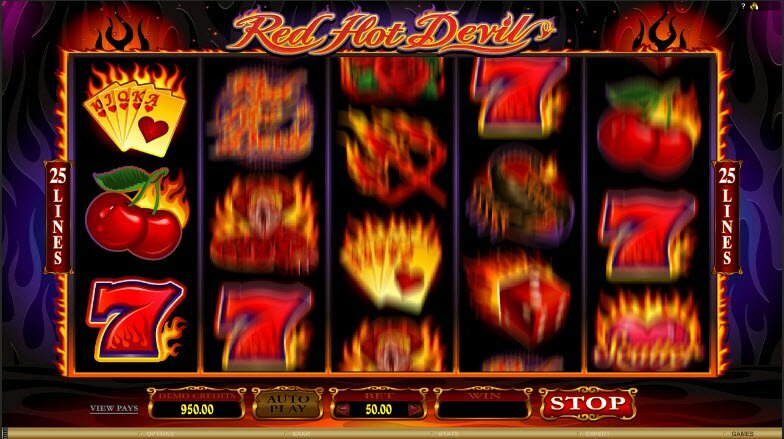 The player can then pick 1 of 3 bonus rounds featured in this Red Hot Devil online slot. The first bonus round features free spins with a 10x red hot multiplier. The second bonus round is the wheel of fire. Take your pick of one of ten of the symbols on the wheel , 9 of the symbols are hearts and one is a jester. 8 of the hearts award the player a prize and the chance to pick again. If you pick the bonus multiplier heart it will multiply all your wins immediately. If you pick the jester he will laugh you out and end the fun and games immediately. The third bonus round offers free spins and up to 3 wild reels on each spin. Landing scatter symbols on reel 1 or reel 5 will re-trigger the bonus round, resulting in wild reels and even larger pay outs. 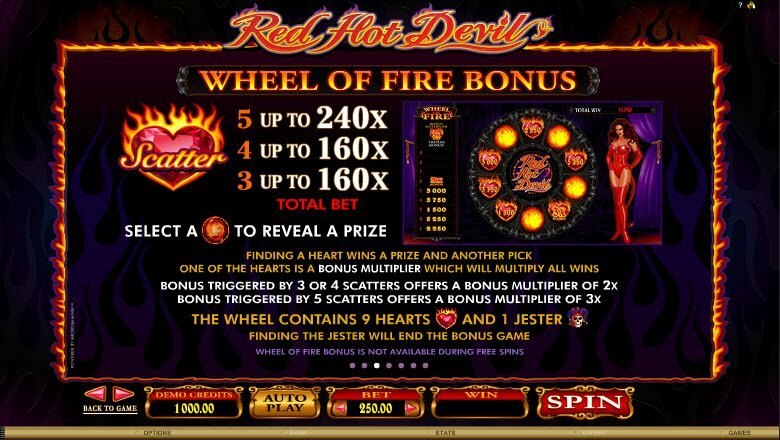 The Red Hot Devil video slot pay-outs are sizzling, it is loaded with free spins, multipliers and wild reels, so rock it out in this slot - the beats are sure to get you in the right mood.